Thompson Boxing Promotions – already a sound fixture in the Southern California boxing scene – is expanding its promotional footprint in the new year. 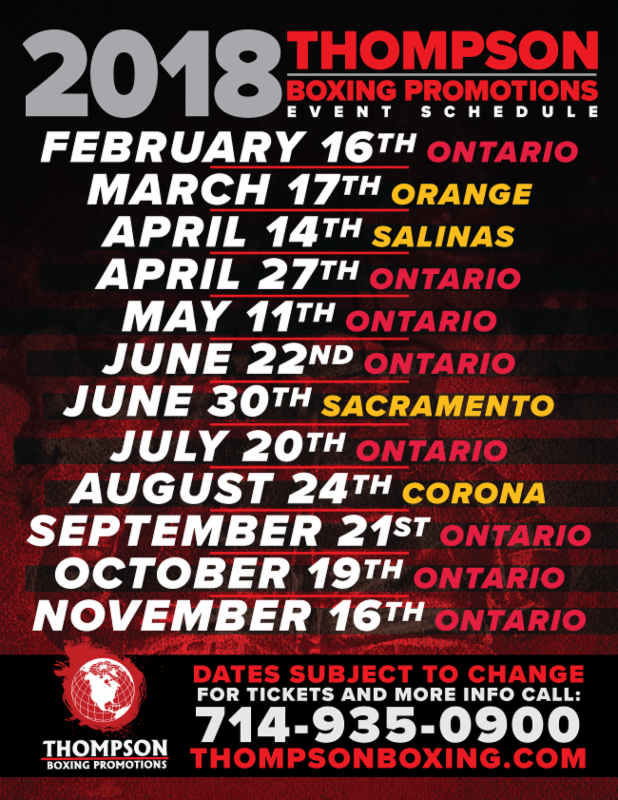 The company’s confirmed dates for 2018 feature two new locations in Northern California – Sacramento and Salinas. Alex Camponovo, longtime matchmaker and general manager for Thompson Boxing, says the company is still considering other locations in the United States. The event in Salinas, scheduled for Saturday, April 14, is a nod to unbeaten blue-chip prospect Ruben Villa (9-0, 4 KOs), who hails from the area. A venue will be announced at a later date. The show in Sacramento is set for Saturday, June 30 from the Omega Products International. The 10 remaining event dates are scattered throughout Southern California. Eight will originate from the Doubletree Hotel in Ontario, Calif., a Saturday showcase is scheduled for March 17 in Orange County, and on Aug. 24, Thompson Boxing heads to the city of Corona in Riverside County. For brand partnership opportunities, please contact Richard Hiskey at RHiskey@thompsonboxing.com. Please see enclosed date list at the bottom of the press release for a full rundown of the 12 confirmed events.